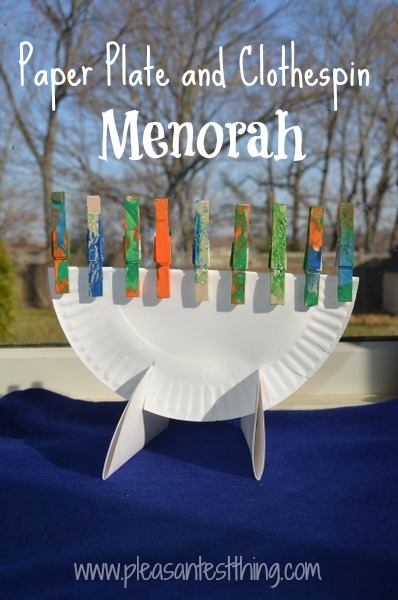 To celebrate Chanukah this year, the kids and I made paper plate and clothespin menorahs. The kids decorated clothespin “candles” with paint and glitter. First we painted the clothespins (keeping an eye on the little guy to avoid clothespin pinches and painting his mouth). To create the menorah, I simply folded a paper plate in half. To form the base of the menorah, I cut the inner circle out of the other two paper plates. Then I folded the 2 little circles in half. Cut 2 slits roughly equal to the height of the small circles into the round side of the larger plate. Place the rounded edge of the folded circles into each slit. This toy can be used to act out the traditional lighting of the menorah. Kids can practice adding the candles to the menorah from right to left. Then they can pretend to light the candles form left to right. This is the way we discussed the placement of the candles, and which candle symbolizes each day. 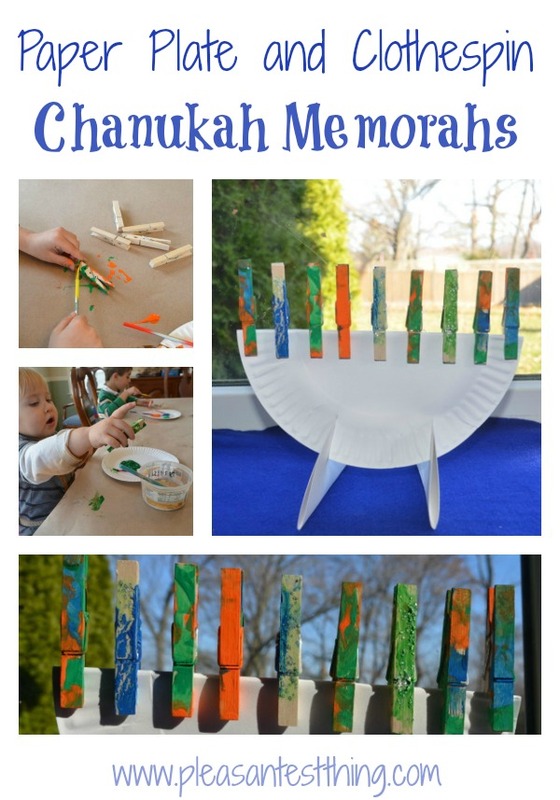 You could also add numbers to the clothespins to represent each of the 8 nights of Chanukah. We’ve had a lot of fun playing with this new toy. For lots more Chanukah ideas and inspiration, stop by my Chanukah pinterest board.